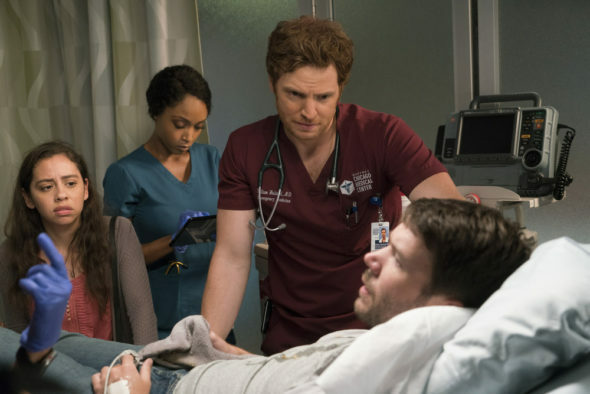 An NBC medical drama, Chicago Med stars Nick Gehlfuss, Torrey DeVitto, Colin Donnell, Norma Kuhling, Oliver Platt, Brian Tee, S. Epatha Merkerson, Yaya DaCosta, and Marlyne Barrett. The story follows the doctors, nurses, and staff of the state of the art Gaffney Chicago Medical Center. As a team, they rise to the Windy City’s most urgent medical challenges while working through confounding ethical quandaries. The series also features crossovers with Chicago Fire and Chicago PD. The fourth season of Chicago Med is averaging a 1.23 rating in the 18-49 demographic and 8.33 million viewers. Compared to season three, that’s up by 1% in the demo and up by 26% in viewers. Find out how Chicago Med stacks up against other NBC TV shows. On February 26, 2019, Chicago Med was renewed for a fifth season, with a start date TBD. Stay tuned for further updates. Will NBC cancel or renew Chicago Med for season five? I can’t see this series being cancelled unless the ratings completely collapse. For now, I’ll keep a hungry on the ratings and update this page with breaking developments. Subscribe for Chicago Med cancellation or renewal alerts. **2/26/2019 Status Update: Chicago Med has been renewed for season five on NBC. Details here. TV show ratings are still important. Follow Chicago Med‘s weekly ups and downs. Find more Chicago Med TV series news or other NBC TV show news. What do you think? Are you happy Chicago Med was renewed for a fifth season? How would you feel if NBC had cancelled this TV show, instead? More about: Chicago Med, Chicago Med: canceled or renewed?, Chicago Med: ratings, NBC TV shows: canceled or renewed? New Amsterdam on NBC: Cancelled or Renewed for Season Two? Chicago Pd has indicated what characters will not be returning for next season; why hasn’t Chicago Med not stated which characters will not be returning for Season 5? Love this show plus Chicago Fire please keep these on air! !